Built by Bibi Raja in A.D. 1450. Built as almost a replica of the Atala Masjid, except about 2/3rd in size and the location of the zenana chamber is placed at the centre adjoining the nave, instead of to the ends of the transepts. The courtyard is a square 132' side. Due to the smaller size, only the central pylon in the sanctuary facade is built, the smaller side pylon being omitted. The gateways follow the design of the sanctuary entrance. 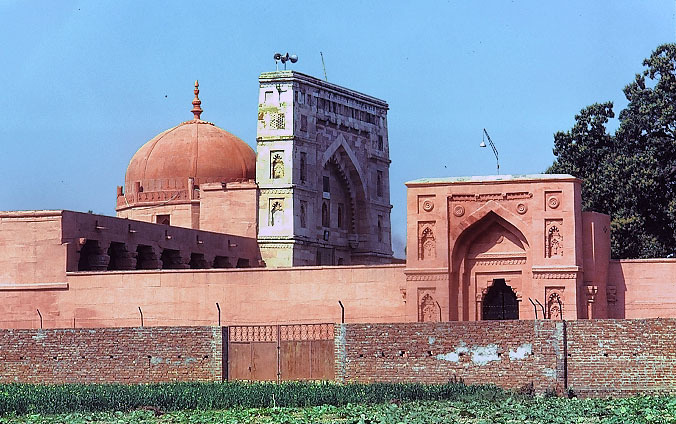 The mosque gets its name from the high gate painted with vermilion through which it was approached from the palace it was attached to.